A truly wonderful performer in as mid/high cable in a true bi-wire or bi-amp configuration (together with STEALTH BASS, for example), Fine Ribbon can also be used full-range with practically all loudspeakers on the market (except for extremely low impedance ribbon-type loudspeakers). FR - "Fine Ribbon" - flat solid core conductors are made of 99.9% pure silver (so-called "fine silver"). A stereo set (not bi-wire) of these cables consists of 4 separate cables: two go to the right loudspeaker, and two go to the left one. Using two separate cables per speaker is better than using two cables in one common jacket because for a given type of cables, .this configuration offers MUCH lower capacitance, and thus increased bandwidth, and the stability of power amps (unstable amplifiers sound harsh). The "wire" used to make FR cables is solid 99.9% pure silver, flat single core conductor 1/8 inch wide and 0.01 inch thick. In FR, no real dielectric is used - at least, in the conventional sense: the silver ribbon is just inserted into a flexible (but strong) transparent outer jacket 1/4 OD, and covered with semitransparent black mesh for strength, so the flat silver wire is surrounded by air only :-) When such construction is measured, the dielectric constant is equal to approximately 1.1 to 1.2 - with (vacuum-air) being about 1.0 and (the closest) solid Teflon being 2.2 to 2.5 depending on the Teflon type (all other known solid dielectric have higher constants; the closer the dielectric constant to 1.0 - the better for the sound because low dielectric constant means low energy storage, which offer fast transients and the lowest distortion). The spade lugs are soldered with WBT-0820 Silver solder. 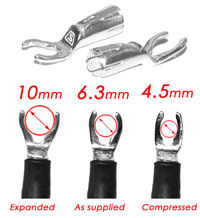 Standard termination is well-known Cardas Rhodium-plated copper spade lugs (6.4 mm binding post opening - as shown on the "enlarged" picture below). Recommended termination is Stealth brand solid silver spade lugs - as shown on the small picture below. We do not recommend using banana plugs unless it's strictly necessary.